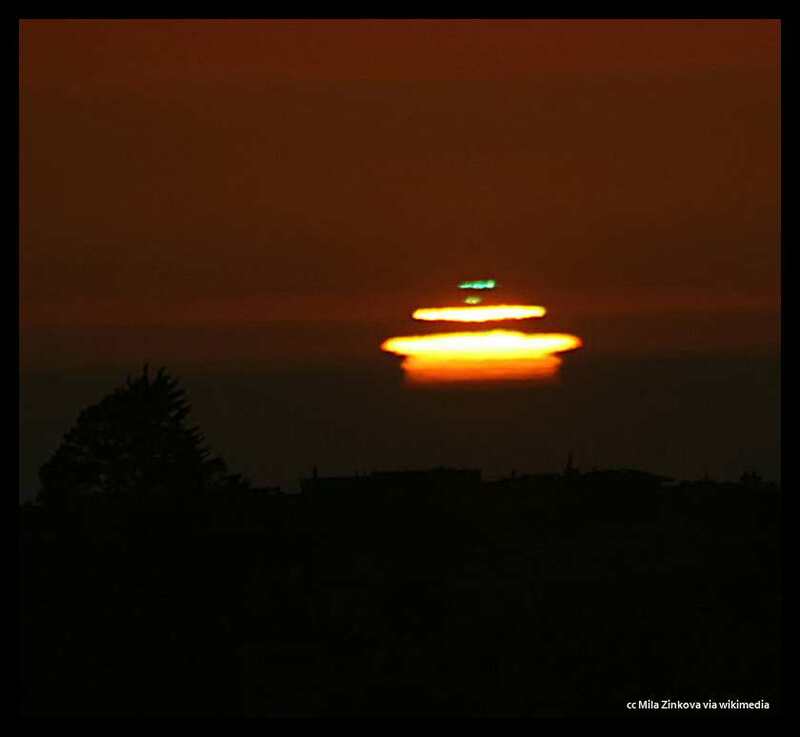 The green flash is not common. That is, it doesn't happen every day and there is really no one beach where it might be more likely to be seen. Some hold that it is an illusion, and that it doesn't really exist. 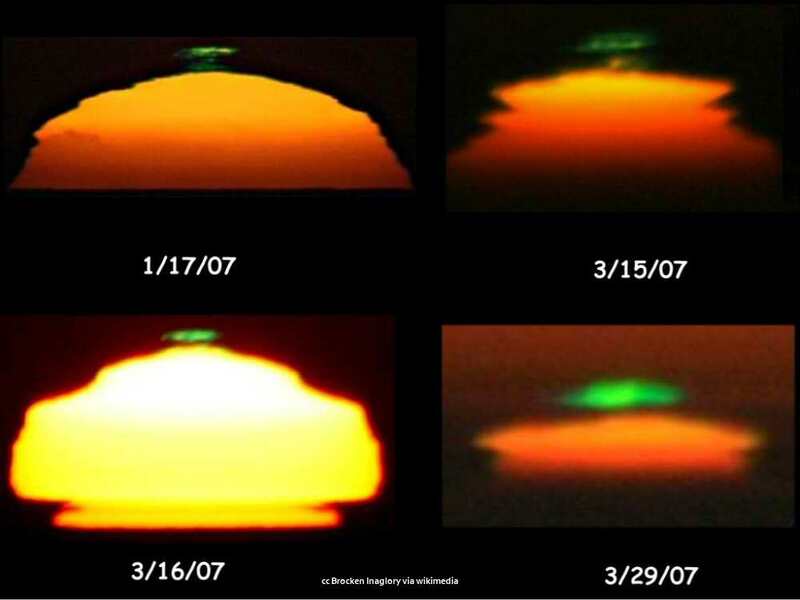 But it is an explainable atmospheric phenomenon that has been captured on "film" many times. Seeing it can be the perfect end to a perfect day at the beach. A previous Photo of the Week selection. "Have you sometimes observed the sun set over the sea? Have you watched it till the upper rim of its disk, skimming the surface of the water, is just about to disappear? Very likely you have; but did you notice the phenomenon which occurs at the very instant the heavenly body sends forth its last ray which if the sky be cloudless is of unparalleled purity? No perhaps not. Well, the first time you have the opportunity, and it happens but rarely, of making this observation it will not be, as one might think, a crimson ray which falls upon the retina of the eye, it will be 'green', but a most wonderful green, a green which no artist could ever obtain on his palette, a green which neither the varied tints of vegetation nor the shades of the most limpid sea could ever produce the like! If there be green in Paradise, it cannot but be of this shade, which most surely is the true green of Hope!" While you may run into someone dressed as the Green Flash at Comic-Con, the comic book character is not our subject here. 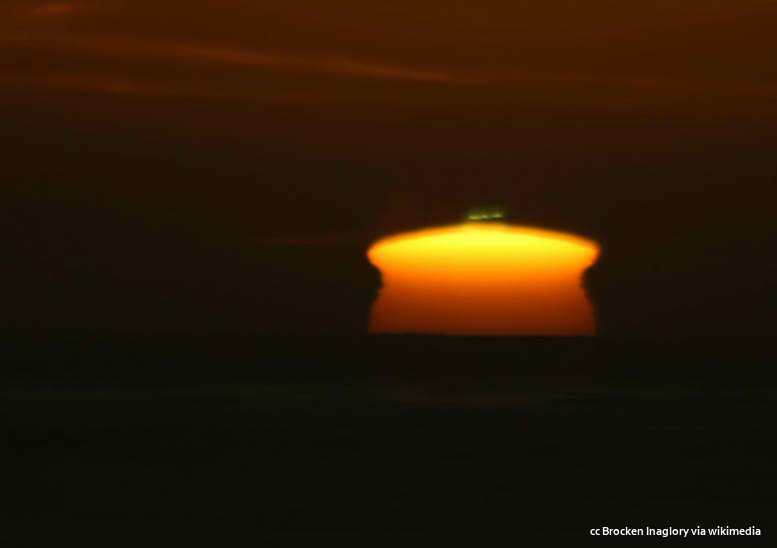 It can happen either at sunrise or sunset, but here on the Central Coast, sunset is where you are most likely to see it as the vast expanse of the ocean is one of the conditions necessary for this phenomenon to occur. Cloudless skies are supposed to be another prerequisite, but I've seen photos of the flash with clouds on the horizon. 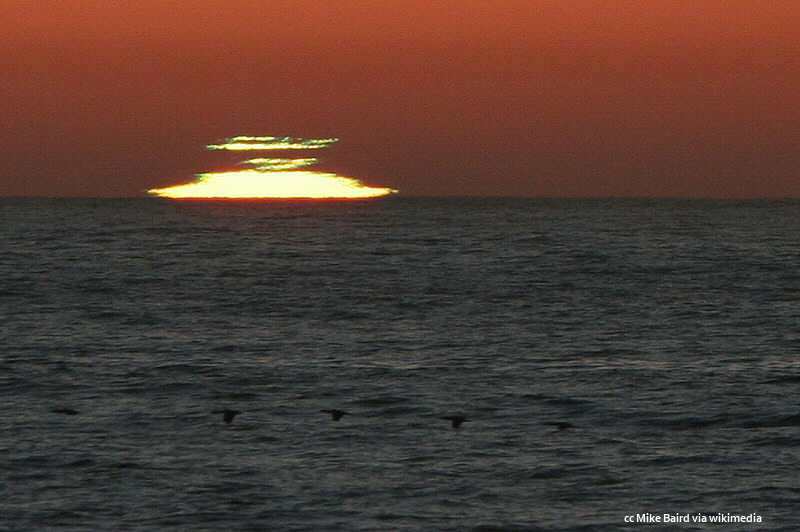 Basically, if you're at the beach at sunset, keep a watch for it as the sun disappears below the horizon. 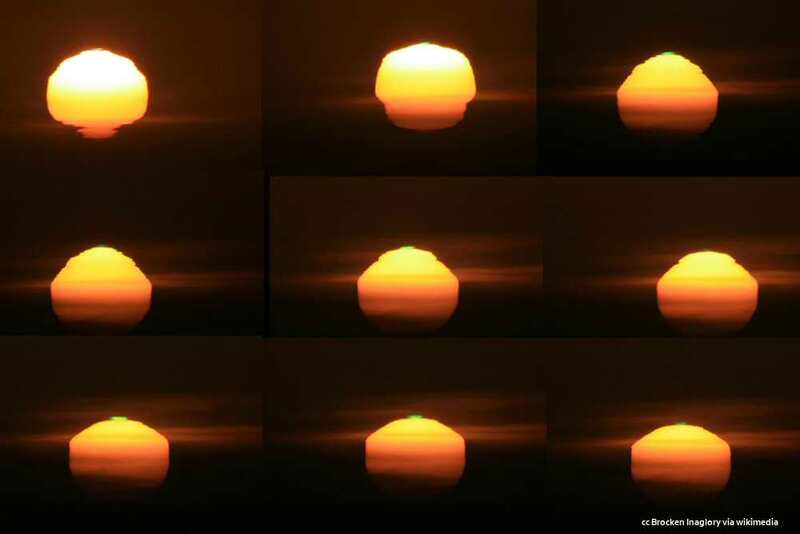 A persistent photographer took the shots above and was rewarded with flashes two days in a row! When I was in college in the San Diego area, I took study breaks around sunset time. I went to cliffs overlooking the ocean and wound down by watching the sunset. It wasn't every evening, but two or three times a week I was out there. I can remember seeing flashes perhaps three or four times. It's not an everyday occurrence, but it is quite stunning to see in person. Needless to say, don't stare at the sun without suitable eye protection even if it is low on the horizon. I don't think that being at an elevated viewing area helps or hinders. The above photo was probably taken at nearly sea level or at most about 12 feet above sea level. It's all about the proper atmospheric conditions, not where you're standing. You're still at the beach! But what Miss Campbell did not tell them was that this Green Ray tallied with an ancient legend, which till now she had never been able to understand. It was one among the numerous inexplicable legends of the Highlands, which avers that this ray has the virtue of making him who has seen it impossible to be deceived in matters of sentiment; at its apparition all deceit and falsehood are done away, and he who has been fortunate enough once to behold it is enabled to see closely into his own heart and read the thoughts of others.